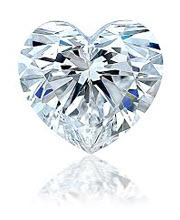 This heart cut diamond ring denotes beauty, style, and sophistication. Give her this precious gift she will cherish forever. A flawless diamond engagement ring that reflects your true feeling of real love. It is a perfect gift that will last a lifetime and the diamond can ultimately be described as a girls’ best friend. A romantic way of asking her to be your wife.